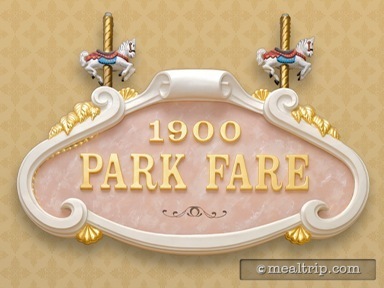 1900 Park Fare is the Grand Floridian’s buffet style character dining location. While some of the interior decor is turn of the century Victorian, the walls, ceiling and carpet are squarely American and never really let you become fully immersed in the theme. Carved carousel horses (you can’t ride them) and a late 1800s Limonaire French band organ are the main decor features. Breakfast characters may include Mary Poppins, Alice in Wonderland, The Mad Hatter, and possibly Tigger and Winnie the Pooh. Breakfast buffet items often include a unique Floridian Strawberry Soup and some slightly elevated classics like Eggs Benedict and Carved Hickory Smoked Ham. More child-friendly items are also available such as Mickey Waffles, Scrambled Eggs and various pasties.